Horn of Africa pirates netted more than $400 million in ransom money between 2005 and 2012, a new World Bank and UN report says. Pirate Trails report says the financiers behind the piracy, and not the pirates themselves, collect most of the cash. The money is then used to fund other criminal operations, including arms and human trafficking. The report calls for a financial task force to root out the money laundering networks. Its key findings suggest that financial kingpins collect 30%-50% of the total ransom, with what it calls the “foot soldiers” only getting a standard fee. This amounts to $30,000 to $75,000 per ship, or just 0.01% to 0.025% of an average ransom payment. The report says the local community in Somalia “provides goods and services to pirates, including food, repair services and khat”. Khat is a legal stimulant in Somalia. The report says the financiers invest in both criminal activities and legitimate business interests. The report recommends increased monitoring of the financial flows from piracy, improved cross-border controls and better regional co-operation. The haul in ransom cash between 2005 and 2012 was put at between $339 million and $413 million. Up to 10 EU naval ships now patrol the waters off the Horn of Africa, which are some of the world’s busiest shipping and humanitarian aid routes. 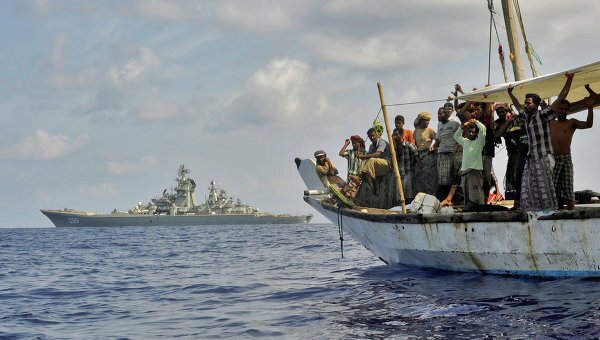 The anti-piracy force’s mandate, which first started in 2008, was expanded earlier this year and it is now allowed to carry out attacks on the Somali coast against suspected pirates.